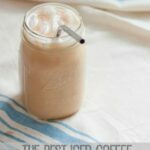 I know that’s a bold title, but I really do think that I’ve found the perfect iced coffee recipe. I typically drink my iced coffee black but this little combo is a great option to have in my back pocket when I’m craving a fun coffee drink. The best part — it’s cool, sweet and creamy and involves no processed sugar or dairy. Woot! 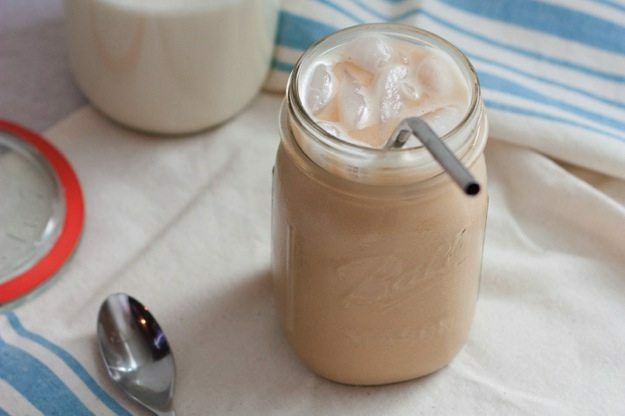 So what makes this iced coffee the best? Well, let me tell you. The whole thing started with me reading this NY Times article about the best iced latte in America. The recipe for the best latte came from Charles Babinski and Kyle Glanville, the owners of G&B Coffee and Go Get Em Tiger in LA. What makes their latte so special? The almond and macadamia nut milk that they make fresh daily. This surprised me because I’ve tried making homemade coffee creations with store-bought nut milks and had little success. 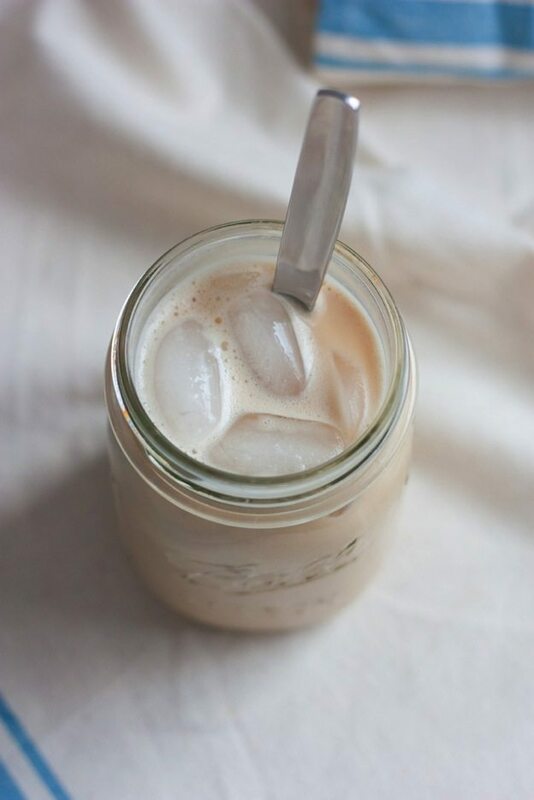 I can make it work if I’m having a hot coffee and froth/steam the almond milk but just pouring almond milk into a cup of iced coffee has never worked in my favor — the milk always seems to separate, curdle and get funky rather than blend in and make the coffee creamy. Their recipe for the homemade almond macadamia nut piqued my interest. So much so, I ordered a nut milk bag, bought a bag of raw macadamia nuts, and blanched a bunch of the almonds so that I could try it out. Turns out, it’s amazing! Like really, the best! Isaac and I can’t stop, won’t stop with it. I don’t make homemade nut milk on the regular (because it’s more convenient just to grab it from the store) but that might have to change. I have everything I need now that I own a nut milk bag and as you’ll see below, it’s really not that hard to make. 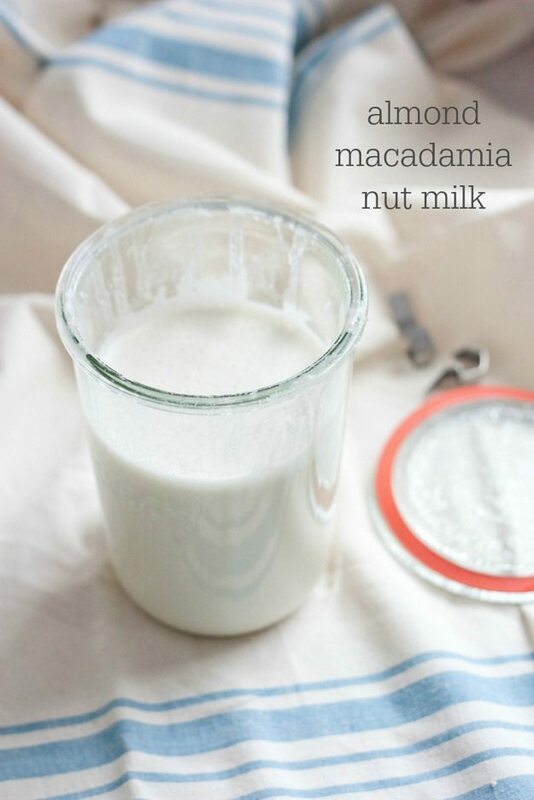 Adapted from this Almond and Macadamia Nut Milk. Blanch your almonds to remove the skin (if they’re not already blanched) — Place almonds in a bowl. Pour boiling water to barely cover almonds. Let the almonds sit for exactly 1 minute. Drain, rinse under cold water, and drain again. Pat dry and slip the skins off. Combine almonds, macadamia nuts and dates in a storage container. 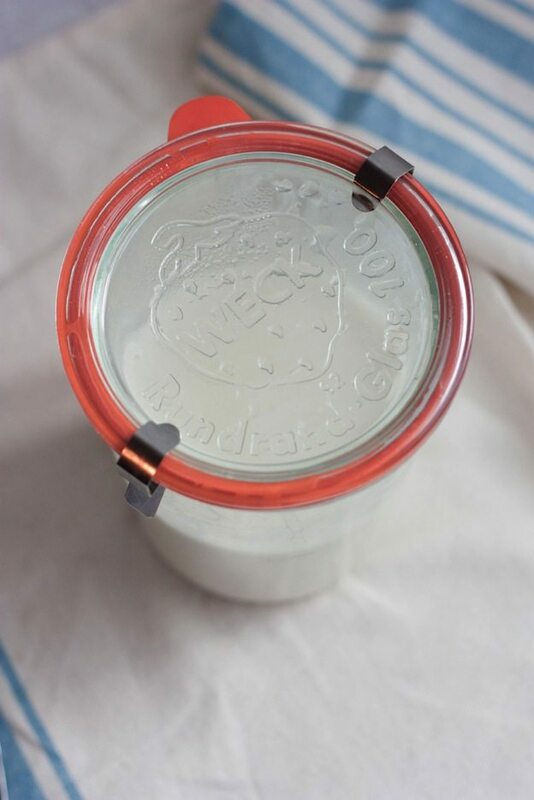 I used a Weck jar. Add water, cover, and let soak uncovered overnight at room temperature, around 12 hours. 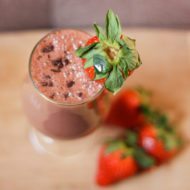 Pour the full mixture into a high powered blender and process on high for 3 to 4 minutes or until finely puréed. The nuts should be broken down into a very fine meal and the liquid will be white/milky. Strain the mixture through a nut milk bag into a bowl, squeezing hard until only solids remain. You should get about 21/2 cups of nut milk and it should be The very silky and creamy. Milk will keep in a seal container in the fridge for about five days. Shake before using. Save the leftover almond macadamia pulp and use it in another recipe like these Raw Cookie Dough Bites. 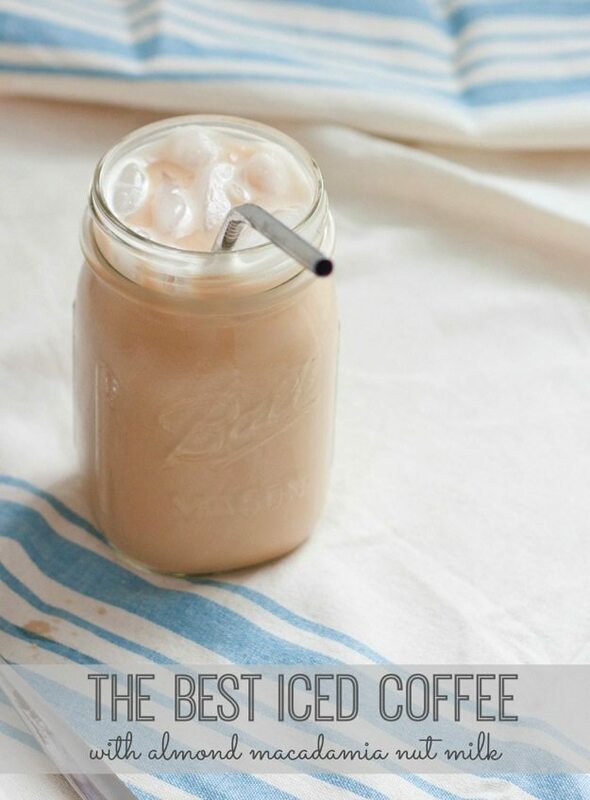 Now you know one important component to making the best iced coffee. Here’s what else you need: cold-brewed coffee. You don’t necessary have to use cold-brewed coffee but I strongly recommend it. We made the switch to cold-brew years ago (even for hot coffee) and we don’t drink anything else. 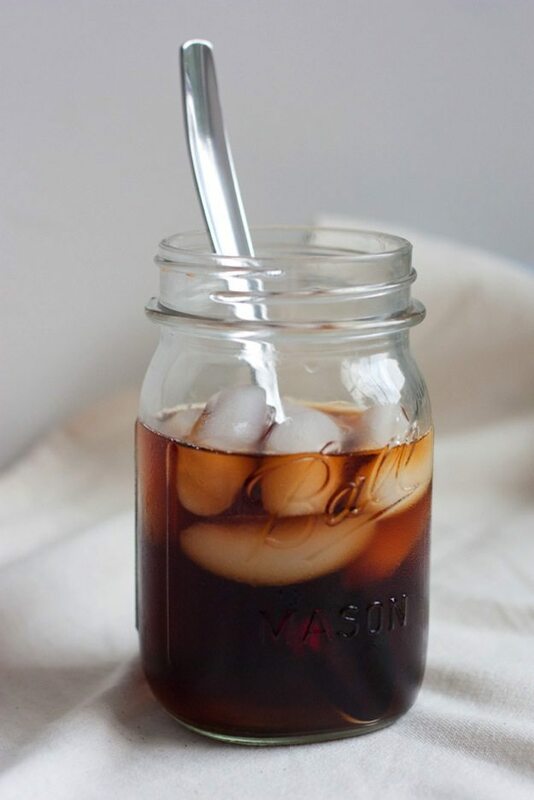 Cold-brewed coffee is smoother, tastes better and less acidic than regular drip coffee. Plus regular coffee that’s been made extra strong, diluted with ice/water and put in the fridge for a day is simply not good. 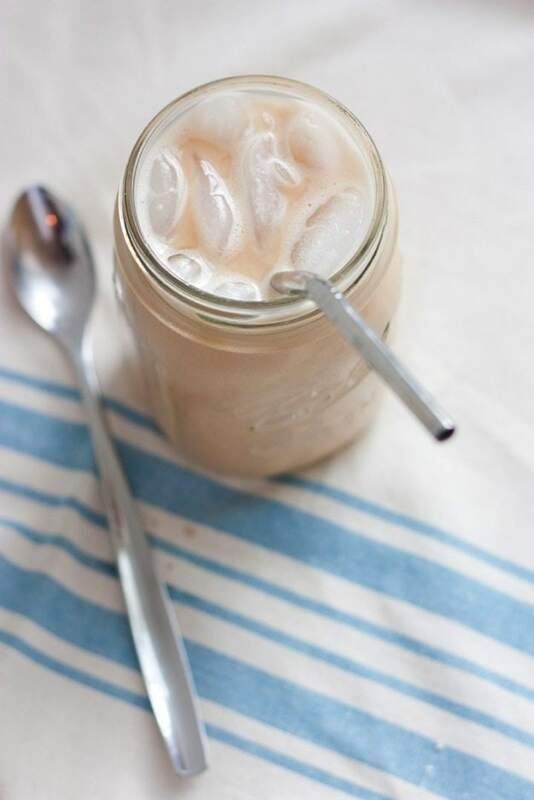 Seriously, I really dislike coffee shops that serve this type of iced coffee. It’s gross. Now that I’ve convinced you to use cold brew — here are your options. 1. You can make your own. We use a Toddy system — it’s super easy and 1 lb of coffee makes enough cold brew concentrate to last us a week or more. 2. You can follow a DIY cold-brew concentrate recipe online or 3. Simply buy cold-brewed coffee concentrate from the store. All the natural grocery stores around us (including Whole Foods and Trader Joe’s) carry it. That’s all there is to it. 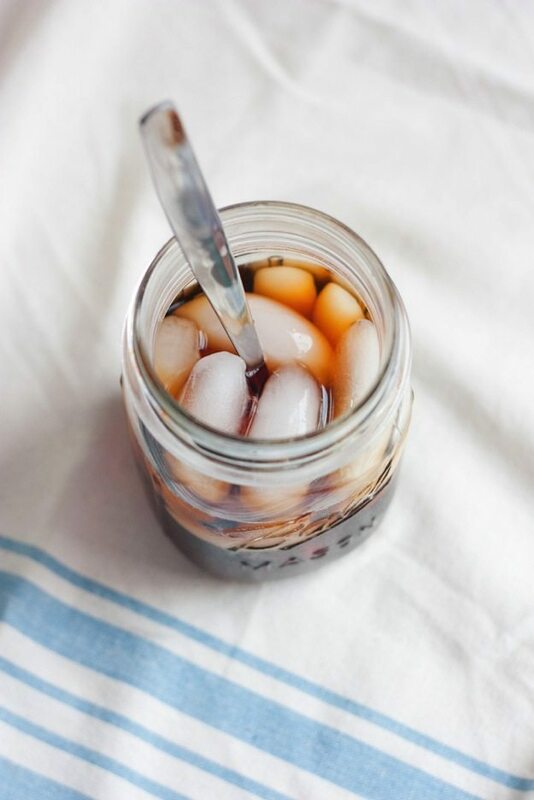 Get your cold-brew, pour a glass of iced coffee — I used lots of ice and about 8 ounces of coffee. If you’re using cold-brew concentrate, add the concentrate and then add water until the taste meets your fancy. The ratio depends on how strong the concentrate is but I usually like 3:1 water, coffee concentrate ratio. Then add the almond macadamia nut milk, just as you would if you were adding cream — you can use as little or as much as you’d like. I used around 2-3 tablespoons. 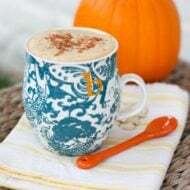 Give it a good stir and serve! I have first hand knowledge that this nut milk is incredibly tasty!! 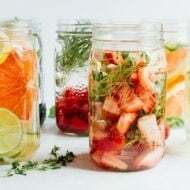 I can’t wait to try making it and adding to my cold brew. This looks amazing. I need to start making my own nut milk. I know it’s one of those things that once I do it once won’t be that hard, but I just need to DO IT. I have been debating making my own nut milk for a while. I always figure grabbing it at the store is easier. However, this coffee creation looks amazing. Love cold brew too! This looks delicious!!! I haven’t made my own nut milk in a while… I need to get back into it! Thanks lady! I hadn’t made nut milk in such a long time before making this blend. It’s really not that hard so I want to get in the habit of making it more often too. Love the sound of the nut milk!! Sounds amazing! Love this type of coffee – I live in L.A. so have had the pleasure of having G&B/Go Get Em Tiger’s famous macadamia almond latte. You can also make cold brew using a French press. Just mix the proper amount of coffee and filtered water and leave unpressed in the fridge over night. In the morning, press and voila: cold brew. 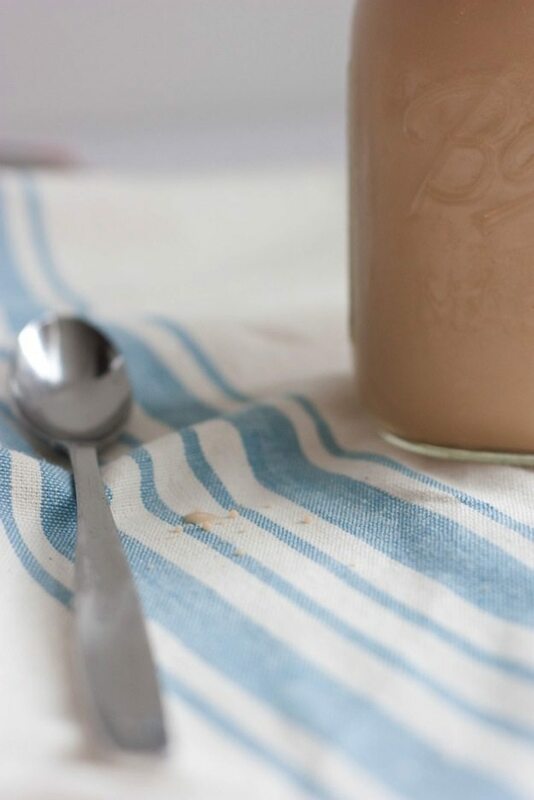 Brittany…Thank you so much for this easy tutorial/recipe for making your own nut milk. I’ve been saying I want to do it for a year or so now, but I always put it off thinking its a long, drawn out difficult process. I bit the bullet so to speak this weekend, and it was the easiest thing ever. I can’t believe I’ve waited this long, and your recipe was so easy to follow. I’ll definitely be making this a staple in my meal prep every week. Thanks again. Just one thing — make the ice cubes with coffee instead of water! When do you add the 2 1/2 cups of water? Is that separate from the water you cover the nuts with? Hi Lynn. It’s the water that you cover the nuts with overnight. You don’t need any extra water.